Clark the Carver of Carve Me A Bear! 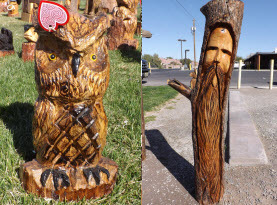 Chainsaw Carvings has over 30 years of experience perfecting his craft of creating works of art out of wood with the aid of his trusty chainsaw. 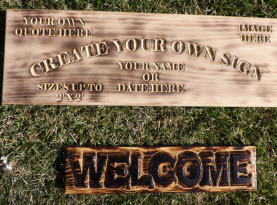 With his unique artistry, you can bestow a one of a kind gift for birthdays, weddings, anniversaries, Christmas, house warming gifts, or a simple gesture to let someone know you care. Clark the Carver whom has won numerous awards and accolades, as well as involved himself with charitable donations, designs statues, sculptures, signs, and furniture that appeals to the young and old with incredible themes. Pine, redwood, ponderosa, cottonwood, and other such quality wood are transformed into Bears, Dogs, Birds, Horses, Raccoons, Moose, Owls, Coyote, Wolves, Bunnies, Squirrels, Lions, Chickens, Pigs, Eagles, Fish, Mascots, Garden Wizards, Mountain Men, Cowboys, Indians, Tiki’s or Totem poles, along with custom furniture such as benches and tables, custom order signs, mantels, flower pots, memorial planters, and much more! 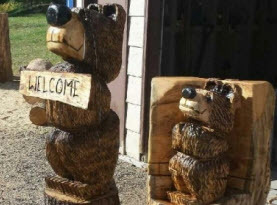 Carve Me A Bear also accepts requests for custom orders. Clark the Carver of Carve Me A Bear! Chainsaw Carvings has many talents when it comes to depicting animals, including the admirable production of various kinds of fish. Avid fisherman or those who enjoy the tranquility of watching the fluid dance of fish in the water can really appreciate the fish carvings. Fish range in size, colors, and beauty depending on their species. With over 24,000 fish species in the world, anyone can find a fish they are drawn to. With a combination of gills, fins, and living in the water, fish are class of aquatic vertebrates that are cold-blooded with the exception of the Tuna and Mackerel shark family. Sharks, dolphins, and whales are often commonly admired with their size, intelligence, and strength. Koi fish and goldfish are another fan favorite, often found in small backyard ponds and fish tanks. Their colorful and graceful movements are often envied and are known to help people relax and find serenity. Trout are another popular request. From fresh water to salt water, fish are always present. Carving these sea creatures is easily accomplished with Clark the Carver of Carve Me A Bear! Chainsaw Carvings. Intricately carving the details in the scales, fins, and other distinct characteristics, your favorite fish carving can adorn your home, porch, or landscape. Those who enjoy fishing can capture their moment with Carve Me A Bear custom fish carvings. Getting a photo of the fish along with the measurements will help Clark the Carver recreate the fish, carved from wood for you to proudly display trophy. Anyone who has grown fondly of their favorite fish in their aquarium can get a sculpture to dedicate to their memory where you can continue to have their beauty shine. No matter you interests in fish, Clark the Carver of Carve Me A Bear! 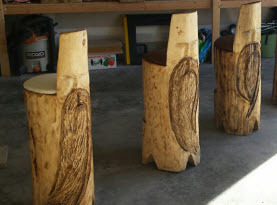 Chainsaw Carvings has the talents and abilities to create a phenomenal carving of your favorite fish. Or if you have a loved one with a passion for fish, we can get your custom gift prepared. Call us today to learn more!